I’ve been wanting to share this recipe with you, which is currently my favourite. What we’ll be making today is to turn a classic Italian dish and transformed it into a healthier, low-carb, low calories, gluten free pasta. 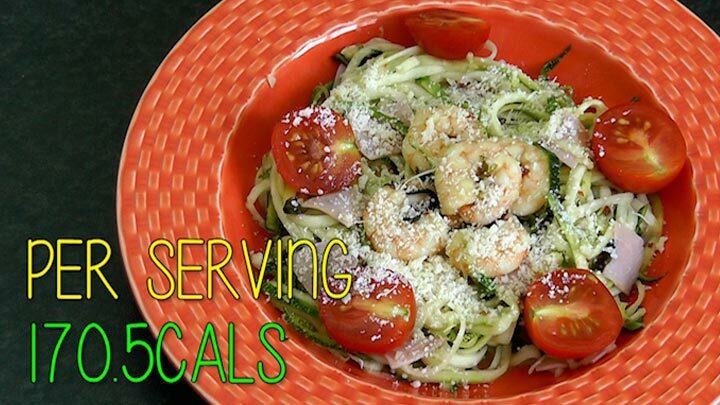 Zucchini pasta is extremely easy to make. I am sure you’ll know by now, all my recipes are really simple and quick. It takes less than 15 minutes to make this. Zucchini is also known as Courgette or if you live in Asia, you may use Japanese cucumber too. 1) To make the zucchini noodles, I am using the vegetable spiral slicer by Procizion. All you’ll need to do is gently press and twist the zucchini just like a pencil sharpener. What you’ll end up with is a large serving of pasta looking dish. Then set it aside. 2) Heat 1 tsp. of Olive Oil over medium high heat. Add garlic and cook for 1 minute until slightly brown and fragrant. 3) Then add in the shrimps and red chilli flakes. Allow the shrimps to cook for about 2 minutes. 4) Then flip the shrimps over and add in the juice from half a lemon, season with salt and pepper and cook for another 2 minutes. Once the shrimps are cooked, mix it the basil leaves, and set it aside. 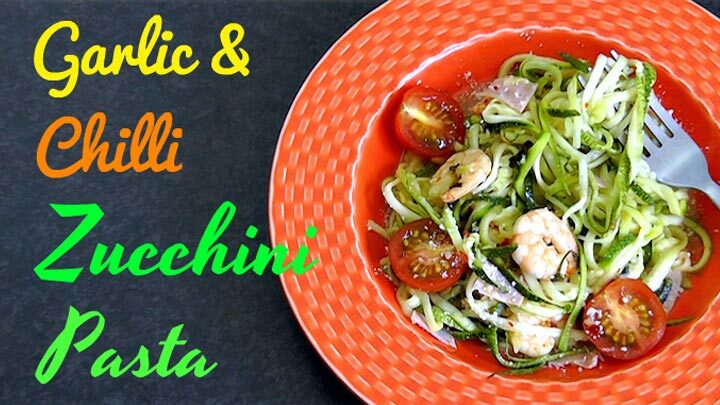 5) In the same pan, add in the remaining 1 tsp of Olive Oil and zucchini noodles. Toss and cook for 3 – 4 minutes until noodles are soft but do not over cook the zucchinis. 6) Remove from heat and combine shrimps and chicken rolls. 7) Finally top your pasta with cherry tomatoes, parmesan cheese and serve. For Vegans, you may follow the recipe and serve without the shrimps, chicken roll and cheese. It will still taste as delicious. If you would like to serve it raw, then there’s no need to cook the ingredients. 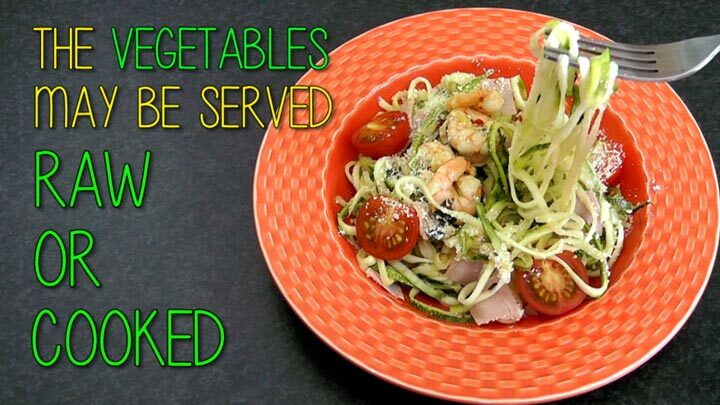 Mix the raw ingredients together, just like you would with salads, expect the shrimps obviously and serve. This plate topped with parmesan cheese only has 170.5Cals, and don’t be fool because it will keep you full. You can even have 2 servings. This Zucchini pasta is great warm or cold. I like to serve it with shrimps as it makes the dish much lighter and I love seafood. I do serve this with salmon too. So you may choose to replace the shrimps with any other protein of your choice. Once you know this recipe, I’m sure you’ll happily replace the ordinary pasta with zucchini as it’s healthier and much lower in calories. Plus, this is a great way to add more vegetables into your diet.